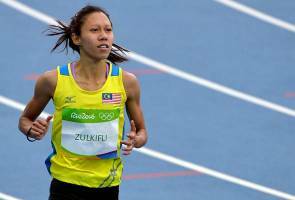 KUALA LUMPUR: National sprint queen, Zaidatul Husniah Zulkifli finally broke the 24-year-old record in the women's 100-metre event at the ASA Speed Series 2 Championship at Bloemfontein, South Africa, early this morning. Zaidatul Husniah, 24, set a time of 11.45 seconds with a speed assistance of 0.4 seconds, thus erasing the old record of 11.50 seconds recorded by G. Shanti at the SEA Pre-Games Championship in Kuala Lumpur on May 7, 1993. The achievement by the athlete from Alor Setar, Kedah was confirmed by national athletics chief coach, Zainal Abas when contacted by Bernama, today. Zaidatul Husniah, however, ended the competition in second place in the Group B final behind host athlete, Tamzin Thomas who represented University of Western Cape (11.44 seconds) while in third place was another host athlete, Tsaone Sebele from the University of Johanesburg with a time of 11.48 seconds. Another Malaysian athlete, S. Komalam Shally ended in fourth place with a time of 11.72 seconds. Earlier, Zaidatul Husniah had broken the national record in the same event with a time of 11.36 seconds at the AGN League 7 Championship in Pretoria, South Africa, last Saturday but it was not recognised because of the wind assistance of 2.5 seconds.